space shuttles, Endeavour : The Two-Way Carried atop a cargo jet, the shuttle is set to take off from Edwards Air Force Base at 8 a.m. PT. It will fly low over Sacramento, San Francisco and Monterey on its way to Los Angeles. Endeavour passed by the Golden Gate Bridge today. The last leg of space shuttle Endeavour's flight to its retirement home in Los Angeles began at 8 a.m. Pacific time today, NASA says. And the space agency has put together a timetable for Endeavour's flybys that will give folks from San Francisco to Southern California a chance to see the shuttle aboard the jumbo jet that's carrying it to L.A.
"The SCA [Shuttle Carrier Aircraft] and Endeavour will salute NASA's Dryden Flight Research Center and the Edwards Air Force Base area after takeoff with a low flyby northbound to Sacramento and the San Francisco Bay Area. "Any time after 9:30 a.m. PDT, watch for Endeavour from viewing locations that include the Bay Area Discovery Museum, Chabot Space and Science Center, the California State Capitol, Exploratorium, Lawrence Hall of Science and Monterey Bay Aquarium. "Next the aircraft will travel south, making a pass over NASA's Ames Research Center and Vandenberg Air Force Base before heading into the Los Angeles area. "Any time after 11:30 a.m., watch for flyovers of Endeavour passing landmarks such as the California Science Center, Columbia Memorial Space Center, Disneyland, The Getty Center, Griffith Observatory, Los Angeles City Hall, the Long Beach Aquarium of the Pacific, Malibu Beach, NASA's Jet Propulsion Laboratory, the Queen Mary, Universal Studios and Venice Beach. Endeavour will land about 12:45 p.m., at Los Angeles International Airport (LAX) . "During the four-and-a-half hour flight, social media users are encouraged to share their Endeavour sightings using the hashtags #spottheshuttle and #OV105, Endeavour's vehicle designation." As the Los Angeles Times adds, "barring any local weather issues, the view from the ground should be good. The shuttle will be flying as low as 1,500 feet above ground level." 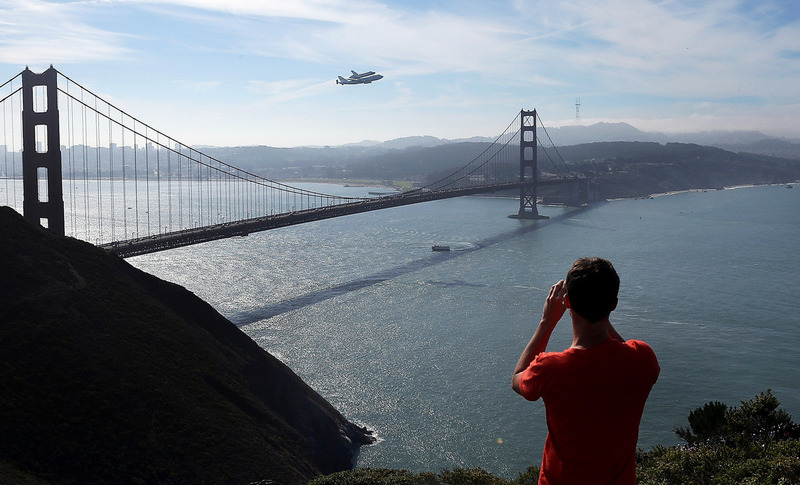 Endeavour has passed by the Golden Gate Bridge, so we've added a photo of that. Update at 12:55 p.m. ET: Endeavour is flying over Sacramento right now. For those of you in or around Los Angeles, our friends at Southern California Public Radio have posted a map and story about "7 places to watch the shuttle Endeavour fly over Los Angeles."